Another round of quietness on The ‘Peel, so how about some more spammer fun. Lat week, I got a note from “Joel Stephens,” who just noticed a post on Canapeel from 2005 — almost TWELVE YEARS AGO! — that is pointing to an emergency preparedness website that has apparently been sucked into another, even bigger emergency preparedness website. I got a little suspicious because Joel’s return email address was at something called ctechemail.com. Looking around, that domain is hidden behind VeriSign, GoDaddy and Domains-By-Proxy, so I was pretty sure it was just a flyby, trying to trick me into pointing traffic to their (presuambly spammy) website. Added to that was that the “unsubscribe” contact was for a technology product comparison website. Yeah, spam baby! Well, a few days later, I got a follow-up email… at 4AM!!! It was the same old song and dance… I know you’re busy, but wanted to follow-up, here’s a copy of what I sent, yadda, yadda, yadda. Somehow, I’d be surprised if you’re actually awake and sending me email at 4am CT. If you’re actually an awakened human, and not some kind of soulless automaton, just fishing for some relevance through other folks’ websites, then kudos — and good morning! Why any human would care one iota about an almost TWELVE YEAR OLD post on a blog in the backwaters of the tubes of the interwebs is beyond me, which is why I’m suspicious of your status of machine vs people. Again, if you’re actually a human, then kudos — and welcome to my way back machine! Frankly, I don’t have a lot interest in chasing every website name change, deep link change, and company mergers across nearly twenty years of blog postings. I am only one human — with a staff of nanobots for the Nanobot Fighting League — and I’d rather be writing about the present and future, in the hopes of soothing the souls of those little nanobots, than revising history, presumably to help drive traffic to someone’s new website. I mean, training the itty bitty botties take a lot of time!! It’s been a little quiet ’round here, so how about some spammer fun. Yesterday, I got a note from “Grace Anderson,” using some mysterious, weird looking Gmail account, offering to sell me a mis-spelled version of one of my domains. To heighten the urgency, Grace let me know that they’re taking offers from any interested parties. Well, that’s pretty much all it took. Enjoy. I’ll offer you a chicken. That’s twice the offer I gave the person last week that offered this domain to me for sale... or maybe a similar one... so much spam, so little time. I only offered them a Cornish hen, which as we all know, is significantly smaller, and will realistically only feed one or two people. A chicken, on the other hand, will feed a whole family one meal, plus leftovers for making soup the next day. And if you’re really good, you can make bone broth from the carcass after making soup. You would need to supply the vegetables, however. To qualify for vegetables, you’d need to offer something bigger. Skywriting would probably get you some vegetables, but it’d have to be really, really good skywriting. Block letters, in a nice serif font that could be seen for days, including a little glow-in-the-dark material that would keep everything nice and purty across a few days. I mean, why have skywriting if it’s gonna just disappear, right? Another week, and more spam… one in the can (presented here), and another to come over the weekend. Today’s tale begins with a simple request to use your humble author’s humble blog as a springboard for advancing someone else’s agenda, and implying that they would gain permission to post it on my site. Really? Well, with that kinda pressure, I felt compelled to respond… and watch for a reappearance of the fighting nanobots! Looking at the website your email was sent from, it redirects to something called Kayak Critic run by a dude named Alex. I’m guessing there’s not really a website called thegreatoutdoorsfix.com … and that’s probably because Alex stole it! I looked at the Whois info for the fixable great outdoors domain, and it appears to be hiding in Panama somewhere, while Alex’s domain is in quiet, steamy Arizona. It’s a long, long way from Panama to Arizona, but I’d bet someone whose charter seems to be to fix the great outdoors could muster up the power of eagles to travel to Arizona to pop Alex right on the snoot!! What do you know about camping with nanobots? I’ve got a whole league of them — The League of Fighting Nanobots! — and sometimes, they seem a little off their game. There’s a lot of pressure in the teeny weenie octagon, and I wonder if their constant training schedule — and all that battery charging! — causes them to get cross. I’ve lost a ton of Q-Tips breaking up itty bitty nanofights lately, and the cost is those is getting to be a drag! Any thoughts on how to survive a camping excursion with the itty bitties? And, where would be best to go with them? They produce an incredible amount of pollution given their size, and it’s not uncommon for me to have to post signage concerning their noxious output. Ever seen the camp fire bean sequence from “Blazing Saddles”? Well, if so, you get the idea. I wish you well on your impending quest for Alex! And since I love stuff like this, I had to respond! Thanks for the nice email! 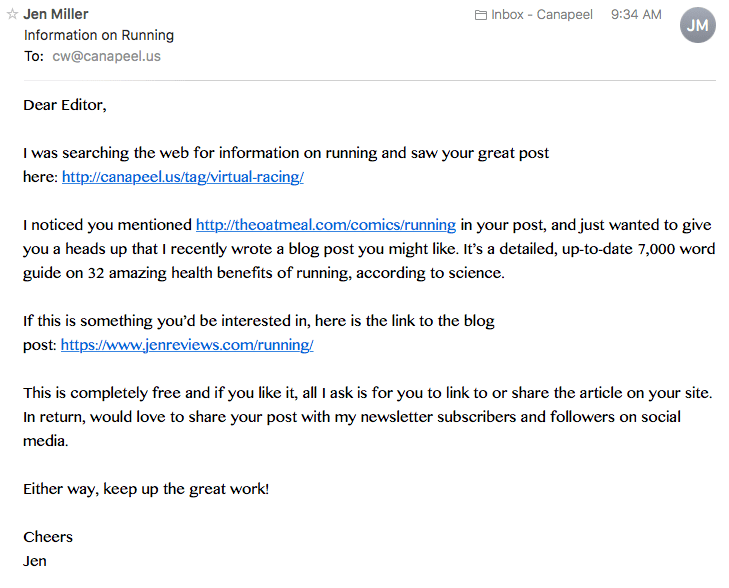 I’m glad my blog showed up on your radar as you searched the world over for information on running. Of course, the great post you noted is actually a site tag fronting well over a hundred posts! I think your automaton that generates (Jen-erates?) emails like this may have gotten confused as it tried to speedily dive into the trials and tribulations of a real person, writing about their real running journey. Of course one post in a hundred is actually created by flying monkeys typing randomly — can you spot that post? And your automaton saw my single link to The Oatmeal website from eighteen months ago — neat! I’m not entirely sure why mentioning that site would put me in the hunt for your detailed, 7,000 word guide on health benefits of running, but it’s cool that automation has forever married The Oatmeal and your article… it’s like a match made in silicon! Looking at your site, I see very little about you and your family. To borrow a phrase I’ve seen on Twitter a lot recently, “sad.” I love to see the folks that are recommending things for me, understanding their motivations, and learning what their automatons eat! It’s things like this that make this kind of exchange much more human, and less bits and nybbles (sorry automatons!). I dug into your site, and noticed that your “Only the Best Reviews” page on the Blog tab shows a buncha pretty cool stuff. I mean, when our automaton overloads take over, that article about “How to Drive a Car” will be crazy important to them! They’ve likely never avoided deer in the highway, stopped to collect beer from an overturned beer tanker, or pushed a car off a cliff to collect the insurance money. These are hugely important topics, and I’m sure you’ve got them covered! I also noticed that every article I saw — and I didn’t look at ‘em all! — had just about 20,000 views. That’s a clue, isn’t it? That’s how many automatons are reading your site, instructing the other automatons on how precisely to take over! Oh, it’ll be a sad, sad day in the world of human affairs once they take over. But that likely will stop all the robocalls. I mean, why would robocallers need to pester automatons, right? Well, Jen, I hope you’re having a great day from what I can only assume is an underground bunker somewhere. Hopefully it’s sunny there, and you’re keeping the little automated beasties at bay!!! P.S. Do you know anything about indoor nano-octogons? That might make for a neat article for your website! Finding the best nano-octagon out there for little nanobots to duke it out is a real pain! With the advent of 3D printing, that’s gotten easier, but it’s still a struggle. The little nanobots get all excited, and sometimes leak oil on the floor as part of their excitement! That makes it slippery for the other nanobots, and that’s a challenge. Thanks in advance! P.P.S. Do automatons dream of electric sheep? Well, the spambots are at it again (as they always are! 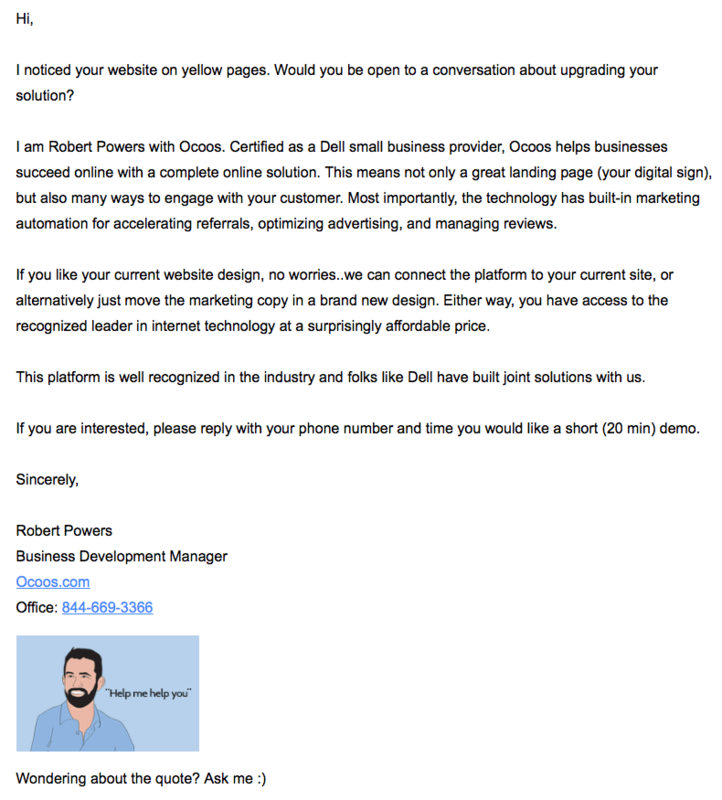 ), and once again, I’ve selected what appears to be a real-human-at-the-helm spambot delivered email to respond to. 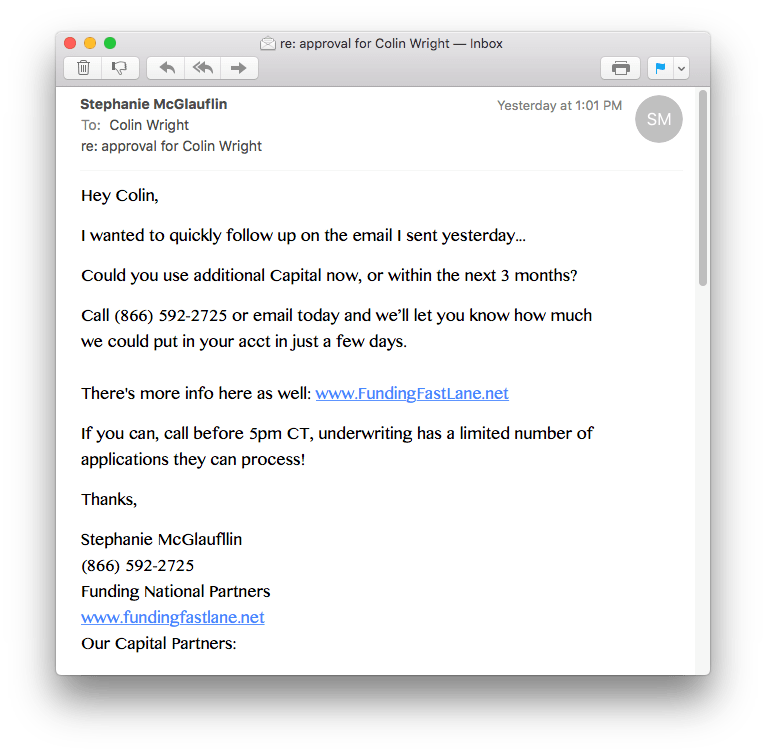 Stephanie McGlauflin, from Funding Fastlane, dropped me a note to offer some funding for my business, presumable Canapeel, since that’s where it was sent. I’m still not entirely sure I understand how folks are coming to think this is a business, but for now, that’s creating some entertainment opportunities for me! I guess she was truly concerned about me! I hate to let someone that concerned about me go without a response, so I put my hands on the keyboard, and replied as only I might. Thanks for the follow-up! I don’t know how I missed your email, but I’m sure it had something to do with the heat generated by My Industry. You see, the heat affects the wi-fi inside My Industry’s building, and, well, that leads to missing emails from folks! I also can’t play PokemonGo on My Industry’s factory floor, which is a bummer. I mean, if you can’t collect ‘em inside My Industry, you can’t collect ‘em all! 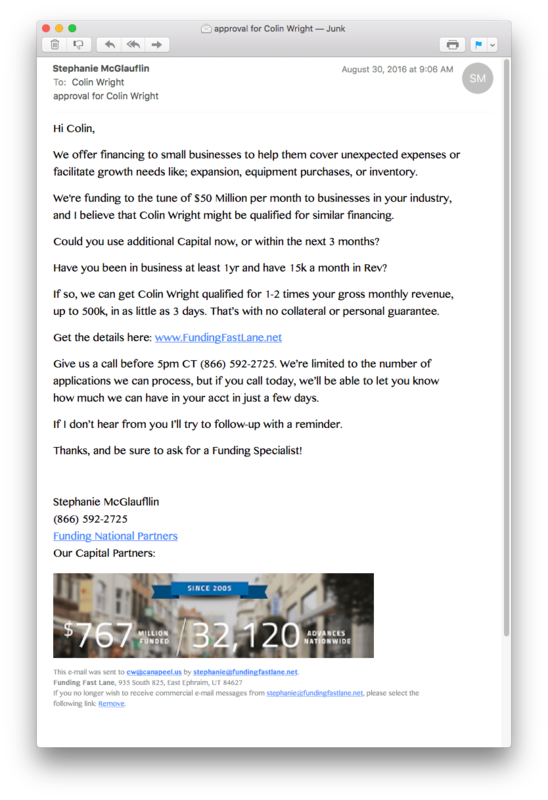 Aside from the metric nano-scale funding for My Industry, I appreciate your offer of capitol for My Industry. My Industry has long held that we need an extra capitol, just in case. I mean, what if Hurricane Sandy had gone a little more east, and our primary capitol in Washington was swept away … or worse, covered in barnacles from all the sea water! Having a spare capitol would be an ideal thing, and likely keep us afloat (get it?) until Washington was dried out, fumigated (think of the dead sea creatures!!!) and made respectable to host state dinner parties again. Of course, we could just build a wall around our capitol to keep the water out, and that might keep us from needing a backup capitol, but that’s probably getting too far into politics. Think about it… What would the 49 states (I count Virginia and West Virginia as one state) think if suddenly there was a wall separating them from a lowly district? I’m sure it wouldn’t go well. Then again, given what happens in Washington, maybe it would! Am I right? My Industry is pretty secretive about how long it’s been around, but I’m not sure how that relates to how fast it spins. You mention something about 15k revolutions a month. That’s a lot of spinning! If I take into account the spin of the Earth on its axis (about 30 spins in a month), the spin of the Earth around the Sun (about 1/12th of a revolution in a month), and the spin of the Sun around the galactic center of the Milky Way (an infinitesimal amount of spin in a month’s time), I come up with being just about 14,969 full spins short of 15k/month. Now, my desk chair can spin, so if I do the math… that’s about 500 spins in my chair daily (assuming an average month — stupid February! ), or about 62 spins an hour during my industry’s normal workday. That’s assuming that My Industry is busy seven days a week — and we are! After all, someone’s gotta feed the nanobots and train them for their bouts in the octagon, and that’s a daily mission. Further extending that math, 15,000 revolutions per month yields about 50 millimeters of growth for My Industry. So, if we suddenly had a need for a second nano-octagon, it stands to reason that I could set up a second chair, and have someone else spin around in it each day to gain another 50 millimeters of growth. It’s not hard to see that My Industry could build a whole army of nanobots, spinning in nanochairs, fueling the growth of more nano-octagons to create the world’s tiniest largest nano-dojo for the training of nanobots in all the skills they’d need to please the human overlords of My Industry. What a thrilling dream!!! Since My Industry is really focused on nanobot fighting machines, the only real outcome from our work is spare micro-parts, snipped off loser nanobots in the micro-heat of micro-battle. To be honest, I’m not sure what My Industry would do with a sudden influx of one-to-two times the number of itty bitty damaged robo-arms and robo-legs. I mean, we have a janitor-nanobot, Rufus, who sweeps up the nano-octagon after the nanobot battles, but I just can’t see paying him the overtime to sweep up even more damaged itty-bitty-bot-body-bits. Unless, of course, you’re talking about sending intact, ready-to-fight-ready-to-die nanobots that can enter the octagon for the pleasure of us human overlords, as we really enjoy watching them whack each other to pieces. In that case, you have My Industry’s attention! Sadly, I think My Industry’s lust for nanobot fighting is likely singular, and not really ready to come out of its teency-weency shadows at this time. If we can get this country past its nano-robo-stigma, the world will be a better place, and My Industry will conquer the world! ’Til then, I believe My Indsutry’s itty-bitty-Italian-stallions will be limited to the dark nano-back-alleys and nano-gin-joints, where they’ll conquer the world, one nano-fight at a time. Have a super itty-bitty Thursday! P.S. Do nanobots dream of electric nano-sheep? P.P.S. I suppose that last post scriptum implies some religious and philosophical overtones about the sentience of nanobots. I can assure you, we have a tried and true process to exorcise the soul from any nanobot used in the nano-octagon. Having a nano-conscience gets in the way of the nano-robo-mayhem, and that just doesn’t make for good nano-entertainment. We ensconce our nanobots in a cube farm, taking tech support calls and sending out bulk emails to unsuspecting businesses in order to drive out any soul our nanobots may have acquired during their robo-studies. I mean, cube farms are described as soul-sucking, so My Industry figured that’s the best way to get rid of that pesky soul. P.P.P.S. Except the Godfather of Soul. All our nanobots have a healthy reverence for James Brown. They even jump back and kiss themselves. It’s part of their basic programming. P.P.P.P.S. But not David Soul. There was a dubious flirtation with David Soul back in the 70s, but the nanobots pretty much got over it after Starsky and Hutch went off the air in 1979. However, we still carry a line of Zebra Three nanobots, a leftover tribute to that adolescent dalliance. I have no idea what the response will be, but it could be microscopically epic! I love silly things, and one of the sillier books I’ve read is Idiot Letters by Paul Rosa. I think it’s out of print, but it’s well worth the read if you can find it. Essentially, the author initiates conversations via postal mail (!) with corporate America, offering up fine, well-reasoned suggestions for their products and services. Needless to say, most of the suggestions are a little … bizarre … and aren’t things a company would really wanna do. As funny as his letters are, the bewilderment from those whose job it is to respond to the public is every bit as entertaining! Recently, I had one of those moments. Did you even look at my website? You should. It’s pretty awesome, using the latest technology and plenty of industry-leading tools and secrets. And most of all, not being a business means I have no real need for spammy-spam-spam-and-spam like this. (Did you notice the Python reference?) Whoever sold/rented you the mailing list that included my website fed you a load of bull-squirt, and you should try to get your money back! I mean, if it included my non-business-website-that-you-never-vetted-before-sending-out-an-email-blast, there are probably other non-business-websites-that-you-never-vetted-before-sending-out-an-email-blast included in the list that you paid for. Your kind offer to do… something… fell on deaf ears with me, and it probably did with many others on your rented/purchased list of contacts. I hate to see our economy impacted by peddlers of bad goods, and it looks like you just paid for a big one!!! But, me being a good guy, and seeing you’re interested in doing the neighborly “business” to “business” thing for my benefit, I thought I should return the favor, and offer up my advice above, free of charge! Yep, I’m not gonna send you a bill for my awesome suggestion. I sure hope you recoup a load o’ dough from that list. Maybe you’ll donate a little bit of that to some deserving business — like a microbrew! — this weekend. P.S. Ocoos is a cool business name. How do you pronounce that? I kinda think it oughta sound like an owl… “ocoo”. (And you’d be lying if you told me you didn’t just hear an owl’s voice in your head!) Of course there’d have to be more than one owl in order for it to be “Ocoos”, hence the trailing “s”. I guess that’s a flock of owls. Or would that be a herd? P.P.S. BTW, while Flock of Owls isn’t a band I’m aware of, I am a big fan of Flock of Seagulls. How much hairspray do you think Mike Score had to use to get his hair to stand up like that? You’re very welcome Robert! Enjoy that microbrew! Yes, I now have my own Idiot Letter! Traditionally, folks take some time at New Year’s, reflect on the year past, and decide on some unrealistic goals for the year just begun. I’d hate to break tradition! I’ve gathered up my milk and pecan sandies, and am ready to take on 2015. Exercise. Embarrassingly, I’ve had a gym membership for most of the last two years. And, like most folks who have gym memberships, I used to go a few times a week when I first signed up, only to drop off pretty quickly. And like most folks (and falling into the best planning of most gyms), I kept the membership alive, telling myself that I was just around the corner from going back soon. Having seen the benefits of regular exercise in my brother, I’ve gotta give myself that same benefit this year. Weight. When I was a young’un, I was a rail. Too much metabolism for my size kept me way skinny. However, life, work, stress and age have conspired to change the way this machine works, and it certainly hasn’t kept me at my once-svelte proportions. Much like my running notion above, I don’t want to stress myself by placing a number of my goal. Simply “less” is what I’m shooting for. If I can keep up with #1 and #2, then #3 should take care of itself. Diet. I’ve never been known for eating the right stuff. I loves me some junk food. However, even beyond the not-as-infrequent burger and fries, my diet in general isn’t all that great. I still eat more red meat than I should, and likely don’t get enough of the good stuff to make me percolate appropriately. I’ve heard all kinds of diets out there — Atkins, paleo, chocolate (ok, not really!) — but the change in my diet that seems to make the most sense is Mediterranean. The addition of fish is a good thing, and the other benefits of that kind of diet are well-documented. However, if we’re gonna do it (and it’d be “we”), I’m gonna need to take the lead on the what and how parts of that, and therein lies the point of this resolution. Anyone who has known me through a long view, knows of my passion around the space program, and the profound disappointment that the future in space that I was promised as a child hasn’t bourn the fruit expected. Today, we humans took just a baby step farther along the path. And I’d be lying if I said it didn’t bring tears to my eyes. This is huge stuff. Big huge stuff. Orion was better than 3500 miles up, making it the first space vehicle designed for human flight to go to high in forty years! It’s a very arguable point, but I still contend that the best thing mankind undertook in the last century was when JFK put us in the position “of landing a man on the Moon and returning him safely to the Earth” in the 1960’s. In my mind, he got it right, and saw the big picture. Just thinking about the industry, technology and other advances made from the discoveries and research from that era alone, it’s hard for me to look upon the Apollo program as a waste of effort or treasure. Jobs and industries were created. People created things and set in motion concepts and ideas that are still bearing fruit in our daily lives. My contention has been that, despite the success of the Space Shuttle program, we have essentially sat on our laurels, though, and wasted the momentum brought on by Apollo. We should’ve been figuring out a way to step off this frail little blue marble, and becoming the explorers that we once were as a people. That next step beyond the Moon, or even the International Space Station, is big, and is probably more than any single country on the planet can undertake alone. And there’s the rub. We can’t all stop yelling and throwing stuff long enough to band together as a people — all people — and take a single step together, much less the many that it would take to continue exploring above low-Earth orbit. I know my view of this is Pollyannic — I get that. But the twists and turns of the last few decades have left us creating a really big “have and have not” consumerist society (and I’m guilty, too … just ask Becky), and in my view, we’ve lost sight of our roots as explorers and creators. We’ve continued to be highly polarized — both on the international and internal playing fields — and it’s paralyzed any movement forward on exploring space, and all the wonders that it could bring to mankind. It’s made all of us protective of our stuff and ideas, suspicious of others, and unwilling to share, regardless of the consequences. So, yes, I’m thrilled about Orion, and the fact that a foundational block has been laid to further the cause of manned exoplanetary voyages. It’s a step. There are so very many more that need to be taken, and an awful lot of them have very, very little to directly do with the exploration of space.